Wed., July 25, 2018, 8:27 p.m.
WASHINGTON – Supporters of a bill that would make international sports doping a crime argued Wednesday that the legislation would deter scandals like Russian state-sponsored drug use at the 2014 Sochi Olympics. 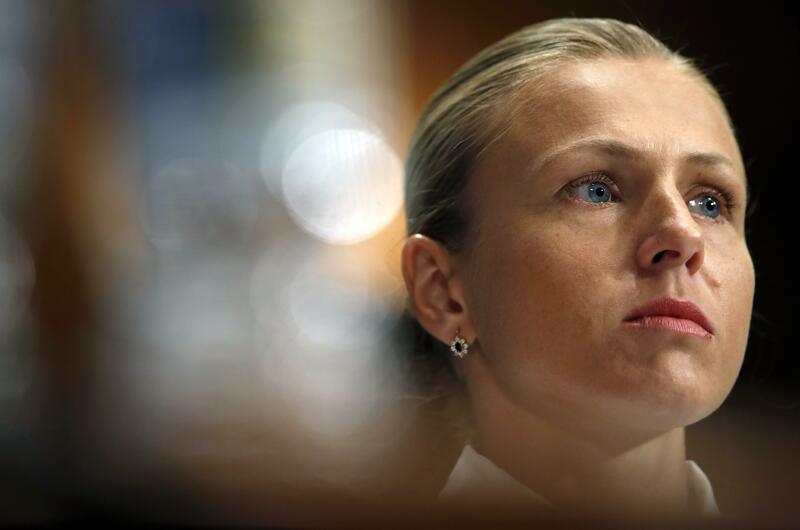 Yulia Stepanova, a Russian former track athlete who became a whistleblower about the drug program, said at a congressional hearing that ending doping in her country would have to “start from the top” – with Russian President Vladimir Putin himself. Several European countries have passed similar legislation. The bill being considered in the House is stronger because it would allow the United States to police doping that occurs outside its borders. U.S. and foreign athletes would be subject to the law if competing in an event that includes four or more U.S. athletes and athletes from three or more countries. The bill has bipartisan support but has yet to be introduced in the Senate, and its prospects for approval are unclear. The hearing occurred while, in the same Senate office building, Secretary of State Mike Pompeo was questioned by lawmakers who accused President Donald Trump of being too soft on Putin. While the president has made conflicting claims about the extent of Russian interference in the 2016 election, the hearing on doping turned attention back to other ways in which Putin’s actions have brought scorn from the international community. In written testimony, Rodchenkov and Stepanova said that those who participated in the doping program were essentially following orders, fearing that to refuse or speak out would mean the end of their careers, or possibly even lead to their deaths. “If Mr. Putin had a different attitude and expressed that, it would stop?” Jackson Lee asked. “Yes, I think so,” Stepanova said. Rodchenkov did not attend the hearing, but his attorney, Jim Walden, said he and his client believe Putin needs to be held accountable. The hearing also featured emotional testimony from Katie Uhlaender, who finished fourth in skeleton – by four hundredths of a second – in Sochi to Elena Nikitina of Russia. Nikitina’s bronze medal was later stripped for suspected doping before the Court of Arbitration for Sport restored it on the eve of the Pyeongchang Olympics. Uhlaender feels that she was unfairly denied a medal twice, although it’s still possible she could prevail on appeal. Travis Tygart, CEO of the U.S. Anti-Doping Agency, said he would continue trying to persuade Congress to address international doping and called on the corporations that sponsor the Olympics to join the effort. Published: July 25, 2018, 8:27 p.m.